Christchurch is the South Island’s biggest city. Affectionately known as ‘The Garden City’, Christchurch has many beautiful botanical gardens, with plenty of pathways for walking and cycling. Perhaps as a bit of a contrast, a meander down Brockworth Street will show you some of the most impressive graffiti and street art that New Zealand has to offer. 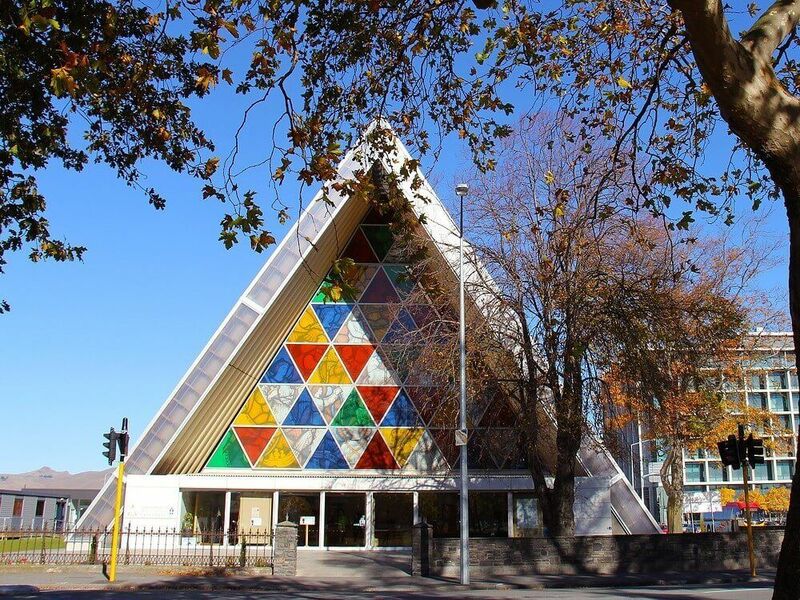 It’s also worth paying a visit to Christchurch’s Transitional Cathedral, more commonly known as the ‘Cardboard Cathedral’. It is one of Christchurch’s most peculiar and most photographed spots. Once a traditional stone cathedral, after a huge earthquake in 2011 destroyed much of the church, its frame was rebuilt using over 500 kilos of cardboard tubes. You can learn more about the earthquake and its impact on the city at Quake City, a special exhibition of the Canterbury Museum. Sadly, over 80% of buildings in Christchurch had to be demolished after the earthquake. This has led to a vibrant transformation throughout the city, as it renews and reinvents itself as its landmarks are rebuilt.